As websites have become increasingly mobile responsive and mobile accessible, and as consumers have continued to shift to browsing the web on their smartphones, the one part that has not kept pace is the efficiency and speed of websites on mobile devices. In 2016 Google officially launched the AMP (Accelerated Mobile Pages) project to directly address this challenge, with some interesting side benefits, as well as some trade-offs. As 2017 kicks off, many users are getting their first exposure to the AMP experience, with top listed results for news articles from companies like the Washington Post and recipe results from AllRecipes appearing at the top of the search results with the AMP “lightning bolt” logo. Users don’t specifically know that this is AMP, but the lightning bolt and prioritized placement make it clear this is the fastest, most relevant result. 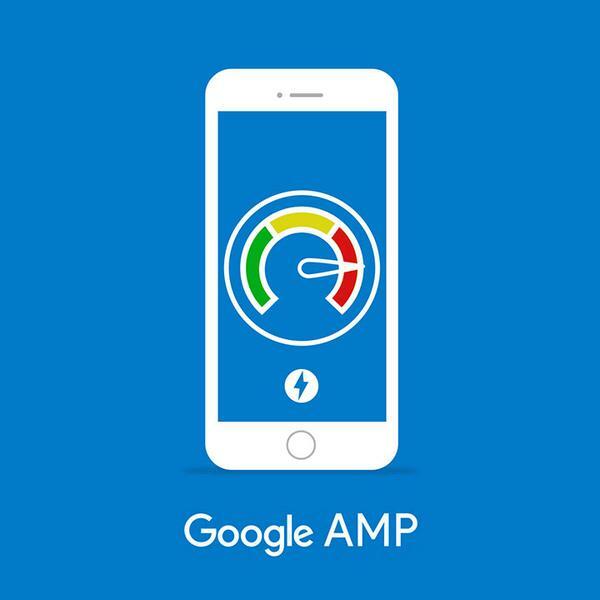 For any brand or digital marketer, getting that position on a relevant Google search is pretty important, so let’s learn a bit more about AMP and what it entails. The AMP project is all about getting your content in front of a user as quickly and effectively as possible. The way it does this is by defining a special version of HTML (amp html) that takes some of the features out of HTML that are known to make websites slow. Think of it as taking the powered windows, subwoofer and leather seats out of your NASCAR. In exchange for doing this, Google (and now Cloudflare) have generously offered to host your AMP pages on their worldwide network so that it effectively arrives instantaneously when a visitor clicks on your search result. Just to make sure consumers know about this new exciting ultra-fast content, AMP results are currently getting displayed with the AMP lightning bolt logo. For search marketers, of course, this is yet another edge to score better on a page speed rankings (although Google insists AMP is not a ranking factor, it surely presents better in “page speed”, so it has an effect). Free Fast Hosting! What’s the Catch? The technical reader is already thinking...wait a second, what about the website I already have? Surely you don’t want me to re-implement the entire thing! Well, no, that would seem a bit extreme. You build AMP pages, but then link them to the “regular” website via a “link” tag, much like you would use a rel alternate or hreflang tag to identify a different format or language for the page..
Industry veterans are already wondering: didn’t we finally all agree “m-dot” websites (where you have a whole separate website on an “m.yoursite.com” domain) are a bad idea? “M-dot” sites came with a whole host of challenges: you have to maintain two websites, features eventually don’t get implemented evenly on both, URLs often don’t keep matching up, etc. Sorry, even though they are most likely going to be a subset of your overall site, Accelerated Mobile Pages will still require developing new HTML/CSS from top to bottom. If your web team has been diligent about keeping content and presentation relatively separate, this might not be a big deal. However, if you spend a lot of time editing HTML in your CMS, expect to do a lot of development work. You also need to re-evaluate some of the more interactive elements of your site. Your standard sliding banners and interactive pieces are not going to work, and are somewhat counter to the ethos of AMP. After all (sorry web dev brethren), without caution these are often things that slow down websites. The good news is that AMP includes some pre-built interactive elements like the “amp-carousel” that you can use to get similar experiences. AMP also only represents the start of a user’s journey, not the end. Although serving ad-content is built into the specification to support the content heavy sites (e.g. news content), those of us with eCommerce responsibilities still need to provide for a smooth user transition from Google hosted AMP content to a slick, fast, secure, very-usable mobile responsive website. To belabor our earlier analogy, just like NASCAR makes speed more important than getting in and out of the car, your development team is going to have to climb in the window with the steering wheel and put on a 5-point harness. AMP is a new specification, and is still evolving, so make sure your dev team is up to the challenge. Wayne Gretzky famously said he skates to where the puck is going to be, not where it is. As digital marketers and technologists who follow the trends, we know it is all about the mobile web, and we know mobile web users have no tolerance for slow, clunky websites. Although implementing AMP is not simple, and it is a ways from being a firm “mainstream” specification (I wouldn’t recommend going whole hog quite yet), it still looks like an important technical initiative for 2017. With obvious support from the 1000lb gorilla, almost-obvious ranking benefits, and even just as a good exercise in isolating your most compelling content and cutting the excess technical fat, leveraging AMP is sure to show returns in traffic, engagement, and conversions. Published on February 17, 2017 .